Plan now to take advantage of Clerk-Recorder Hugh Nguyen’s special Saturday hours this upcoming Saturday, December 19 from 10 a.m. to 3 p.m. at the Old County Courthouse in Santa Ana and the department’s branch offices in downtown Fullerton and at the Laguna Hills Civic Center. With the fast approaching end of the year, demand for services is expected to be high. The Old County Courthouse will be offering marriage licenses, civil wedding ceremonies and passport application services only. 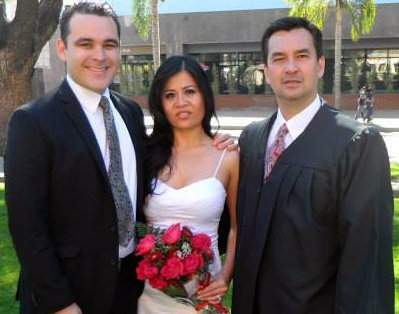 Copies of property records and birth, death and marriage certificates will be available at the Laguna Hills and Fullerton branch offices, as well as obtaining marriage licenses and civil wedding ceremonies. Please note that the department’s South County branch office in Laguna Hills is now offering passport services. Free parking will be available at all three locations. The department experienced a slight surge in demand for services during its October and November Saturday openings. Department staff issued more than 150 marriage licenses and performed over 100 marriage ceremonies during each one of those Saturday openings. The department is expecting demand to be high during its December Saturday opening since it will be the last Saturday opening for 2015. Orange County has one of the lowest costs for a marriage license and marriage ceremony in the state. Couples can obtain a public marriage license for $61 and a confidential marriage license for $66. A civil marriage ceremony can be performed for an additional $28. To save time, marriage license and passport applications can be completed online at www.ocrecorder.com. As an added convenience, passport photos are available for $15. Appointments for civil marriage ceremonies and passport applications are recommended. To make an appointment or for more detailed information about the services available at the Clerk-Recorder Department, please visit: www.ocrecorder.com. « What kind of scumbags would steal a wheelchair from a legless girl?